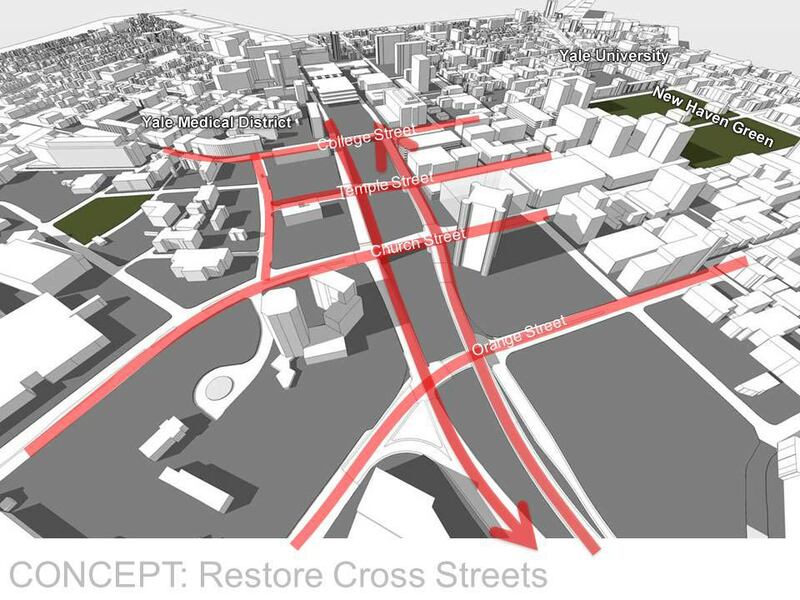 On November 10, 2012, environmental advocates and concerned citizens held a press conference at College Street and North Frontage Road calling for a revision of the development of the Route 34 East / Downtown Crossing plan. The New Haven Environmental Justice Network and the Yale Student Environmental Coalition are concerned the plan as proposed will do little to address environmental and health hazards – including respiratory disease, asthma, and other health impacts – related to Route 34 traffic. The groups, which will be present with signs and banners, chose a rush hour conference to underline the impact traffic has on this area. The current development plan expands road surface to accommodate commuters and support new development of office space and parking garages. The predicted increase in traffic will lead to more dangerous streets and also worsen already environmentally poor air quality standards. Vehicles onRoute 34 annually emit over 34.6 tons of hydrocarbons, 13,548 tons of carbon monoxide, and 29.8 tons of carbon dioxide (from study in 2000). It is imperative that development both supports economic development and human well being. Projects that focus disproportionately on developers’ interests generally fail to serve the community well, create significant hidden health costs, and can limit other long- term growth. The New Haven EnvironmentalJustice Network and the Yale Student Environmental Coalition, call for the City to amend the Route 34plan to better support alternative transportation, significant pollution decreases, and create and environment welcoming to walking and biking. Read more about community concerns with Downtown Crossing.